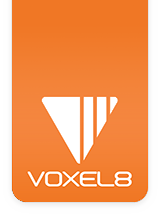 As with all spool based 3D printers, the Voxel8 Developer's Kit is susceptible to twisted filament on spool predicaments. This may happen if you are not double checking your thermoplastic filament feed during a loading procedure. A piece of filament may become looped or twisted within the filament bay such that the filament will stop feeding correctly (see Picture 001a-c). The twist in Picture 1a is the most common, Picture 1b is a different angle of the same problem, and Picture 1c is a really unfortunate example of filament twists which you require undoing material off the spool and re-spooling (or just cutting filament off where the twist or bend occurs). Picture 001a: Twisted Filament problem in a spool of unchecked PLA filament. Picture 001b: Another example of filament twisting from a different angle. Picture 001c: Really bad example of filament twisting. The outcome of this will be a skipping event where the extruder cannot get enough material to print, and there is an audible clicking noise at the top of the FFF print head. If a skipping event should ever occur, you should immediately stop the print, but DO NOT pull on the filament to remove it. This may cause a break in the filament which may cause an extruder jam, making it more difficult to fix on your own. You should carefully follow the skipping event resolution instructions here. To avoid this problem, you want to check your spool every time before you start printing to avoid this problem to ensure that no filament loops exist (see Picture 002) and that the fed between the extruder and filament bay is not limited. When not using your filament, your spool should be properly wound up to prevent twists and kinks. There are two holes contained the on the spool for inserting the filament during storage (see Picture 003). This is a good convention to use when not printing with a spool, since it will reduce unspooling accidents and alleviate introduction of filament twisting occurrences. Picture 003: Properly wound filament prepared for storage. If you need more support on this issue, please contact us.